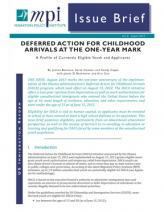 This issue brief analyzes the Obama administration's Deferred Action for Childhood Arrivals (DACA) program at its one-year mark. The researchers find wide variation in application rates across states and national-origin groups. The study also finds that 49 percent of the currently eligible population has applied to date. Based on an innovative methodology to analyze U.S. Census Bureau data, MPI estimates that up to 1.9 million unauthorized immigrants under age 31 are potentially eligible for DACA — with 1.09 million currently meeting the age, education, length of residence and other criteria; 423,000 appearing to fulfill all but the education requirements; and 392,000 who are too young to apply now but would become eligible once they reach age 15 if they stay in school or obtain a high school degree or equivalent. The brief highlights that there may be substantial barriers for a significant portion of the unauthorized population in meeting DACA's requirements. Of the individuals who fulfill all about the education requirements, MPI estimates that 58 percent have completed some high school, while 42 percent have not completed any high school grades. Over two-thirds (69 percent) are limited English proficient. These factors, along with low income levels, parenting responsibilities and other issues, make it difficult for many to enroll in the adult education or career training programs that would make them eligible for DACA. The issue brief also highlights pronounced differences in uptake rates by state. North Carolina represents the high, with an estimated 74 percent of its currently eligible youth population applying, while New York and Florida are substantially lower at 34 percent and 35 percent respectively. California and Texas, which together account for 45 percent of all applications accepted by USCIS, are closer to the national average, with 49 percent and 54 percent respectively of currently eligible youth applying.